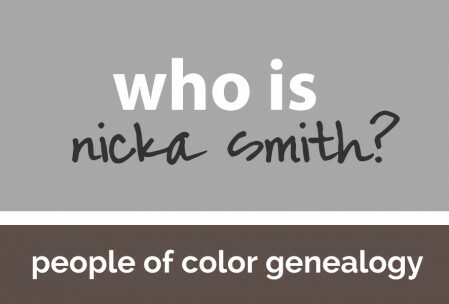 Watch the BlackProGen POC Genealogy Hangout - who is nicka smith? Did you miss our latest Google+ Hangout? Check out the recording now! The second of six Google+ Hangouts hosted by me and sponsored by #BlackProGen took place on September 22 included a lively and informative conversation about people of color and the issues that they face in genealogy. We had panelists hailing from California, Kentucky, Maryland, Tennessee, and Virginia. We discussed African American, Latin, and Japanese genealogy research. For a list of the panelists and their websites, as well as links to some of the things we spoke about, see below. Click here to access the event page which includes links to some of the documents we discussed. What’s your feedback regarding issues that people of color face in genealogy? Sound off on these questions in the comments area. You’re in an elevator with a person you just met and you’re talking genealogy. In one minute, sell them on why there is a need for genealogy geared focused on people of color. What are some of the incorrect assumptions made about minority/people of color genealogical research? What’s the genealogical consensus on saying slave versus enslaved? Whose verbiage is correct? Who decides how one is supposed to call their ancestors? Don’t forget to join us on October 13 as we talk about issues the African American genealogists online toolbox.